Toss sliced plums in the cornstarch and put in the bottom of the ramekins. Bake until filling is bubbling and thickened and the topping is crisp. Top with a dollop of greek yogurt (not included in calorie count below) and enjoy. P.P.S. You can make this with most fruits. P.P.S.S. We ate it for breakfast. LOL. Now calorically, of course you'd be better off eating an egg-white omelette, but compared to a traditional crumble you're doing great. 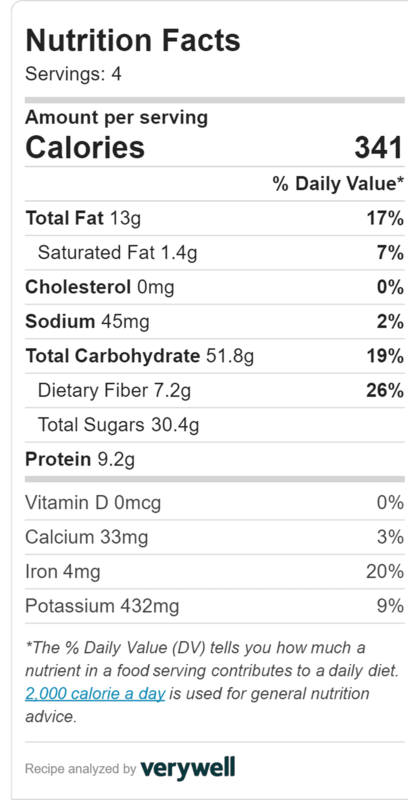 Also, check out the percentage of you daily fiber - 26%(!) that's over a quarter of your daily requirement in a dessert! Plus, 9.2 grams of protein in a dessert is respectable, not to mention 20% of your iron requirement, and there's plenty of heart healthy fats in here.